Enjoy ocean views from the decks of this beautifully decorated townhome. Community pool. Raised walkway to beach across from house with the ocean less than 30 yards away. This affordable vacation rental has everything you need and more. 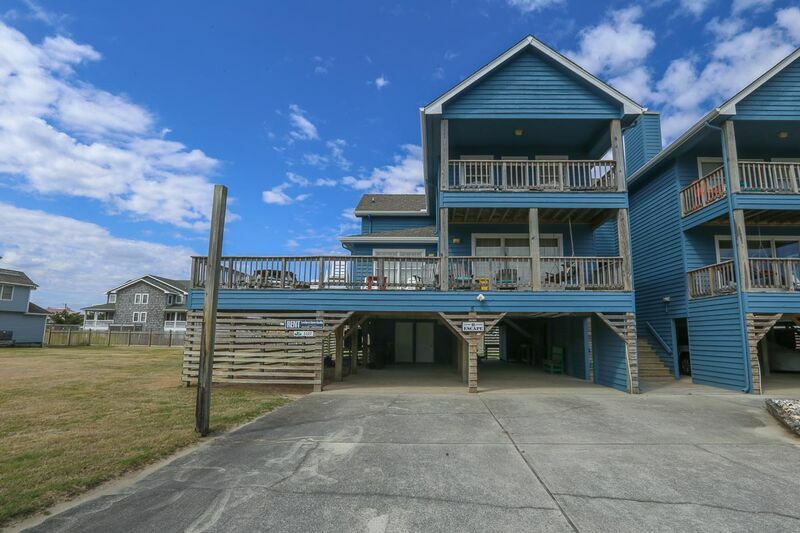 Pelican Watch complex has great beach access and is next door to the Kitty Hawk Pier and Hilton Garden Inn. Bedroom with Queen (full bath). Large, wraparound sundeck. Kitchen with wet bar, dining area, great room. 3 bedrooms (1 master bedroom with King, jacuzzi; 1 with Queen, 1 with Twins), Full bath, laundry closet. My family has been vacation in the Outer Banks, NC for 25+ years and have spent the last 15 summers in this phenomenal home. The ocean is a short walk across a quiet street and the pool on the street is a nice alternative to the beach, especially for young children. It truly is R-Escaper and our home away form the home. the location is fantastic, the house is beautiful, and incredibly well maintained. Every summer there is something new - a room redecorated, new furniture, new dishes. My boys have spent every summer of their lives in this home and absolutely love it as do my niece and grand children. If you are looking for a great house, in a very convenient location that is comfortable and spacious this house is for you. Already looking forward to our return next summer!